SOG QUESTION: ANY OTHER SERIOUS SOG COLLECTORS OUT THERE? Discussion in 'General Knife Discussion' started by OnlySOG, Sep 3, 2018.
microbe, hexenjager, SpySmasher and 1 other person like this. Welcome! I'm not a big SOG guy myself, but some of their older model fixed blades look fantastic. I know @craytab had a nice collection of them at one point, though I believe he's sold most of them now. Would also love to see some pictures of your collection. OnlySOG, hexenjager and SpySmasher like this. I'd love to see your collection, too. I've got 3 SOG fixed blades and 2 folders, so I'm no serious collector but at least all mine date from the Seki days. OnlySOG and microbe like this. I had an SOG knife, was very unimpressed with it, and none of them have ever really spoken much to me, honestly. I still have two others, but they were free junkers that came with a couple sights I bought for my target and hunting bows. I use them, but have no particular taste for them, they just exist and cut a few times until they need sharpening (cheap 420 junk, not even HC). I must ask, why SOG, so specifically? I always wanted to try out the VG10 Vulcan. I'm down to two SOGs. A Flash 2 I picked up on my honeymoon and an AirSOG. Remember those? My collection is decent, which includes some rare SOGs. I’m eventually standing up a website that will include pics, specs, and a short description. As far as pics... here’s a small teaser of some of my Flash II collection. These pictured knives are not rare at all by the way. DirtyDave100 and microbe like this. My collection is vast, which includes some of the absolute rarest SOGs. I’m eventually standing up an ONLYSOG.COM website that will include pics, specs, and a short description. I know this may sound like the other SOG Collector website, but mine will have probably four times the knives to display for SOG Enthusiasts. As far as pics... here’s a small teaser of some of my Flash II collection. This is an older pic as I have 4 additional Flashes not included. These pictured knives are not rare at all by the way. There is a story behind why I only collect SOGs. I personally like the company’s credo in paying homage to some of the finest military knives made, especially as a retired Marine. Also, I simply don’t have the room or income to purchase everything I like. The Tomcat II was my first SOG - Awesome! BeyondTheBox and microbe like this. Not a collector or anything, but I've got a seal pup which is a good utility fixed blade for the price. I wish it wasn't partially serrated but have gotten used to it. There is a story behind why I only collect SOGs. I personally like the company’s credo in paying homage to some of the finest military knives made, especially as a retired Marine. Also, I simply don’t have the room or income to purchase everything I like. The Tomcat II was my first SOG and selling off my collection will keep my fingers busy during my retirement in a few years. I personally like Vehement Knives paying homage to some of the finest military knives made and so I bought a Bark River Knives (Vehement) MAC-VSOG in 3V. Love it. It is beautiful. I have one SOG knife in Aus-8 ... what is it the 30yr Anniversary SOG that was put out last year? That is one of two knives in my collection in Aus-8. If SOG makes a fighting knife in S35VN, I'll buy two, one for myself and one for my brother. I love the knives, but I do not love Aus-8. If you have a line to the CEO, email them and let them know there are many of us out here waiting for an S35VN copy of their fighting knives. The discontinued SOGs have the predominance of the best high carbon steel, like SK5. Check out my website, it will probably be of use to you. If you use anything from there please just give the site credit. DirtyDave100, jux t, OnlySOG and 2 others like this. 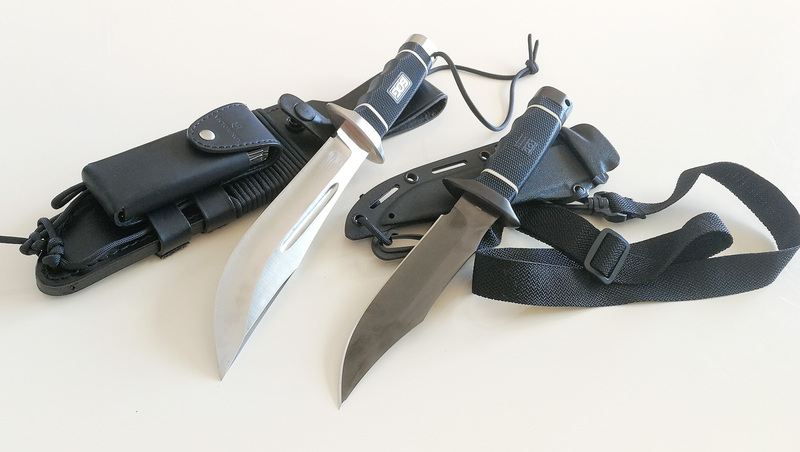 I am not a real SOG collector, but I do like their Bowie style fixed blades and what they represent a lot. I have 2 of the Taiwan made models, and it will stay with those until SOG upgrades their steel. In general, I think for the AUS8 they use, they are way overpriced. When talking about the older SEKI models, I would love to find a SOG Tech II for a decent price, but $400 for a used one is imho a bit crazy. I supose that is just the law of supply (none) and demand. I have a fully serrated AirSOG that is actually a pretty nice knife. Bought it back when I used to visit fleabay a good bit (like 10 years ago). The Flash II was one of my worst SOGs and have owned three of them (blade play mostly). I still have most of my SOG knives that I have purchased. I gave away a Twitch II to a granddaughter. I was very big into SOG knives when I first joined BF. It was a fun journey, but most journeys come to an end. At this point, I would be willing to sell just about any of them. I would keep the Mini Vulcan and probably at least one fixed blade (Tech II perhaps). I still like SOG stuff in general; I just have moved on to other brands and makers. DirtyDave100 and OnlySOG like this. The guy is after information and or direction. I think the only potentially rare SOG that has passed through my hands was one of their fighters in damascus, made in Japan. Sold it on ebay many years ago. Was a very nice blade and I think one of a very limited #.